Do you love your slow cooker as much as I do? This week, the Virtual Potluck gang is celebrating the virtues of crockery cooking by throwing a party with Hamilton Beach and Harvard Common Press. I’m bringing my own homemade Quick and Easy Tomato Ketchup. Thanks to Donna from Cookistry for hosting this potluck. This is a sponsored post on behalf of Hamilton Beach and Harvard Common Press. It contains at least one affiliate link. Ever since I received my slow cooker and a copy of Not Your Mother’s Slow Cooker Cookbook by Beth Hensperger and Julie Kaufmann, I’ve been slow cooking like crazy. The Hamilton Beach Set & Forget® 6-quart programmable model has both a temperature probe and a programmable timer. If you use the probe, it cuts off (but remains on a “keep warm” setting) when your meat reaches a specified temperature. If you use the timer, it switches to the “keep warm” setting after a certain amount of time. Over the last couple of months, I’ve used my slow cooker to poach a whole chicken, make sloppy joes, cook whole-grain porridge overnight so it’s ready for breakfast, make my own cinnamon applesauce, create vegetarian stews, and make homemade ketchup. 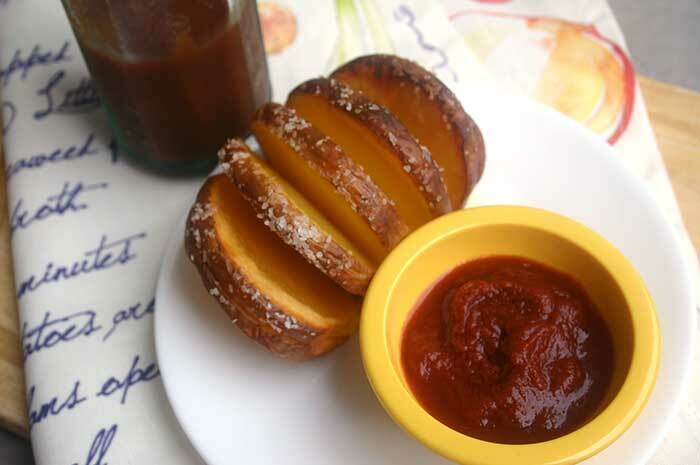 That’s right … zesty low-sodium ketchup without high-fructose corn syrup or preservatives. The Grillmaster, who historically hasn’t been a huge ketchup fan, loves this homemade variety. He likes to cook up a bunch of lentils, plop a fried egg on top and slather this spicy ketchup over it all. 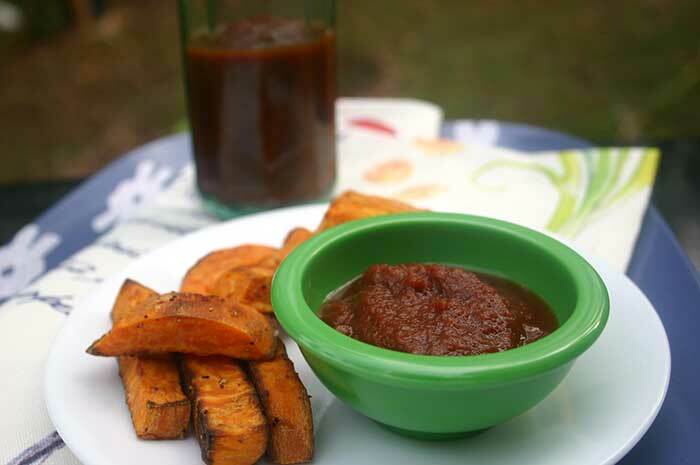 The cinnamon and other pumpkin pie spices make this condiment the perfect thing to serve with baked sweet potato fries. We ate it on our Garlic Home Fries with Kale too. The original recipe calls for apple cider vinegar, but I had some jalapeño white balsamic in the pantry begging to be used. It gave just the right amount of kick. If you don’t want your ketchup to be spicy at all, use a milder vinegar and skip the red pepper flakes. Why should you make your own ketchup instead of buying a bottle at the supermarket? It’s insanely easy to do in the slow cooker. You can control the amount of sugar and salt. You’ll know there isn’t any high-fructose corn syrup or preservatives in the final product. Most importantly, you’ll love how it tastes! In a blender or food processor, combine tomatoes, onion, shallot (if using), vinegar, brown sugar, mustard, allspice, cinnamon, mace, ginger, cloves and red pepper flakes. Blend until puréed. Pour mixture into slow cooker. Cover and cook on HIGH, scraping down the sides and stirring a few times, for about 2-1/2 hours. Remove the lid and continue to cook the ketchup on HIGH, scraping down the sides and stirring a few times, for about an hour or until the ketchup is the consistency you want. (Test to see if it “plops” off a spoon.) Season with salt and pepper. Turn off the slow cooker and let the ketchup cool to room temperature in the crock. Scrape into a glass jar. Serve warm, at room temperature or cold from the refrigerator. Store, covered, in the refrigerator for up to two months (but it won’t last that long). I used jalapeño-infused white balsamic vinegar instead of cider vinegar. 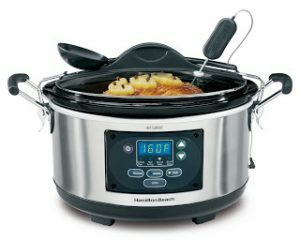 Disclosure: I received a free slow cooker from Hamilton Beach and a free copy of Not Your Mother’s Slow Cooker Cookbook by Beth Hensperger and Julie Kaufmann from Harvard Common Press. I also received a second slow cooker and copy of the book to give away. All opinions are my own. This post contains affiliate links, which means if you click one of them and make a purchase, I will receive a tiny fee. Please see my disclosures page for more information. Love cooking in my crockpot as often as possible. I need a large crock pot for my bone broth! Homemade ketchup is so much better than store bought and I love the idea of making it in the slow cooker. has several bells and whistles that your mother would have wanted with her first crock pot, more than 30 years ago. Even before Super Bowl parties and tailgating became common gatherings, cooking for a crowd got easier by using slow cookers to make, take and keep the food warm while everyone had a good time. These small appliances, generically called slow cookers today, were an immediate hit because they are such a kitchen time-saver. The original Crock Pot by Rival, introduced in 1971, was an innovation. I remember when these came out, and they were as hot as any small kitchen appliance you see advertised today. The technology continues to evolve, and models have become smaller, larger. The newest models include multiple temperature settings, removable stoneware inserts, hinged lids, clamp-on lids, and the list goes on. I love slow cooking Chile! Can this ketchup be frozen? How long would it keep in the fridge? Hi Llynn – The ketchup should keep in the refrigerator for about 2 months. Store it in a glass jar with a screw-top lid. I’ve never tried freezing the ketchup, but don’t know why that wouldn’t work. Let me know if you try it.